This old snapshot spent a long time languishing in a drawer. 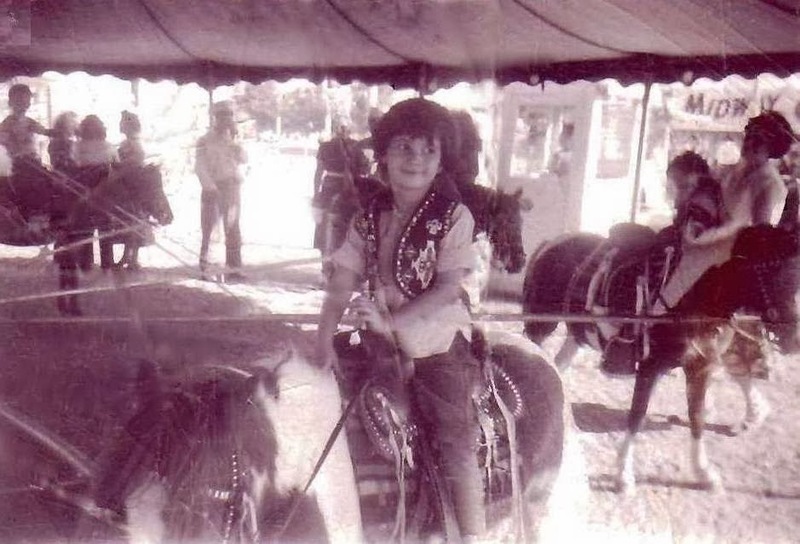 It's me on a pony ride at the Colorado State Fair in Pueblo. The snapshot was scratched and full of creases. Last night I decided to fix it up, although the task looked impossible at first. Besides, the State Fair is in August, and today is the 31st, and it's time. So I scanned the photo and used Painter IX's digital scratch remover, which isn't as easy as it sounds. You have to enlarge the digital image past all recognition and continuously compare it to the tiny snapshot to make sure that you are actually removing a scratch, rather than an important part of a pony. The result isn't perfect, but at least the image is recognizable, and I am glad to have another nice memory restored. It's good to remember that just because something seems to be irretrievably lost at the moment, sometimes there's a chance that it might not be lost forever. 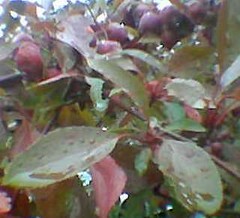 This morning I saw this crab apple tree on my way to Heather's place, and decided to take a picture with my phonecam, despite the rain. It has been raining off and on all day, and the day is kind of gloomy, as if to remind us that fall is on the way. I thought this image kind of matched the feeling of the day, kind of sad. Maybe the weather? and the news about the hurricane? Sadness is part of the picture, part of art, part of life. Today classes started at the University of New Hampshire and Mel began his regular commute from Beverly, so I am posted this image in his honor. I took this photograph with my phonecam on one of our recent trips up there, and tonight I cropped the image to improve the composition. 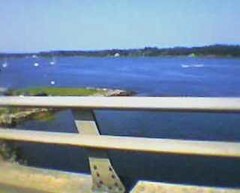 The commute to UNH takes you over several long bridges across some beautiful lakes that take your breath away. It's hard to get a good view from a moving car, but I keep trying: I open the window, I hold the cellphone outside the car as we are moving, I drive Mel crazy. I guess sometimes it's hard to have an artist in the passenger seat. 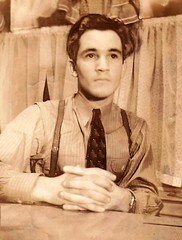 . .
About six or seven years ago, one of my aunts gave me some early photos of my Dad that I had never seen before. I was looking through them recently and came across the original version of this one. The back was labeled "self-portrait" under his name and date(1938, when he would have been around 20). He must have used a remote device to take this picture of himself. But apparently the flash was too strong, washing the color out of his hair. There were also some scratches and other minor problems. So I decided to edit the photo and post it today (August 29 was his birthday). I scanned the photo, then used Painter IX's digital photo tools to darken the hair, remove a scrap of paper on the table, fix some scratches, and crop the image to focus on the face of the young man who would become my father ten years after this photo was taken. My father was a musician (like my son) and talented in foreign language (like my daughter). It was nice to remember that also liked to take pictures (all those home movies!) And it was also nice to think of this as a kind of collaboration, as I edited the self-portrait that he created all those years ago. On an early morning walk during the week, I took this photo with my phonecam. I liked the way the morning sunlight looked on the white blossoms. Tonight I cropped the image just a tiny bit to improve the composition. I like the quiet optimism of this plant, which blooms in the summer heat and seems quite capable of withstanding drought. This is the third and last version of this image. Tonight I used Painter IX's digital watercolor to modify my photo of the staircase in the Alfama. Although my inspiration was the muted pastel colors of the older Portuguese houses, I used brighter versions of the same colors to communicate my excitement at being in Lisbon. I even applied color to the laundry hanging on the line, turning it into part of the composition. Time to leave Lisbon, at least for a while. Ate logo, Lisboa! It seems a shame to leave Lisbon. Why not stay? Tonight I took the photo that I posted yesterday of the stairway in the Alfama and modified it with Painter IX to make the elements of the picture more visible. I used washes of digital watercolor to add color contrast so the column at the top of the stairs would show up better against the sunny sidewalk. I also brought the colors of ocean, sky, and clay tile roofs back up so they are visible, as they were when I took the photo. But I stayed close to the original colors, and when I did change a color, I used a color that was already in the photograph. Next, a fantasy version of the same scene. You can meet me back here tomorrow, if you like. Time for another picture from Portugal. On a trip to Portugal in July of 2001, Mauro showed me around Lisbon. 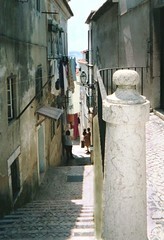 I wanted to see the Alfama, an old section of Lisbon that is built on steep hills with stairs instead of streets. I took a lot of pictures there, and have used some of them as the basis for some watercolors. Tonight I cropped this photo and adjusted the brightness to capture the shadows and bright sunlight of the Alfama. 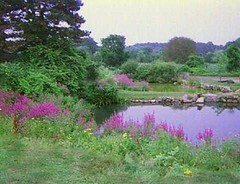 Yesterday I drove up to New Hampshire to meet Mel at a UNH event which was held in a beautiful garden. I especially liked the border of flowers against a stone wall. I took a picture of it with my phonecam, but the image was too small to show the detail and too blurry when I enlarged it. So I used Painter IX to create a clone using digital watercolor and the impressionist brush. 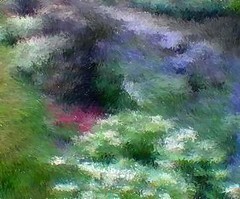 It was fun to watch the image emerge, and forget everything but this magical garden, just for a few minutes. Yesterday the New York Times travel section featured Belfast, and today I framed two of my watercolors of Northern Ireland for Mel's office. So I decided that today's entry for my blog would be an image of Northern Ireland. Tonight I cropped this image from a photo I took last summer. This farm is just outside the Giant's Causeway, so close to it that I edited out our little red rental car that we had parked along this road while we went to see Northern Ireland's most famous attraction. Scenes such as this farm are of course less famous, and less likely to be associated with Northern Ireland, but in fact this is what much of the countryside around Belfast looks like. Tonight I used Painter IX just to sharpen the edges of the buildings, but I didn't adjust the color. It really is that green. Who knows, this image might turn up again in a watercolor. 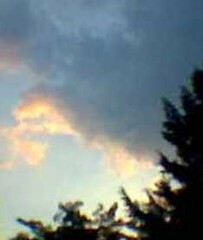 This is a photo of the summer sky as the sun is going down. I took this photo a few weeks ago with my phonecam, but the original composition bothered me. Tonight I took another look, and cropped the image to eliminate the silouette of a tree that was on the left, and that seemed to solve the problem. I thought of this photo when I went outside to take a little walk after dinner. During the summer, evening is often the best time to take a walk, and that is certainly true today. In addition to cooler temperatures, you get to see some beautiful color in the sky as a bonus. This seems like a good day for an imaginary trip to the Colorado mountains. 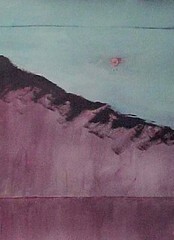 This is an acrylic watermedia painting that I did several years ago and donated to an art auction. These mountains are painted from imagination and memory, but the color is not too far from what you can really see in Colorado, especially at sunrise or sunset. Here's another photo from yesterday's walk. 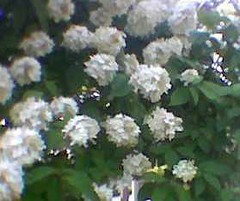 I had to use my phonecam when I saw these white flowers. When I was growing up in Pueblo, we kids all used to call these "Snowballs." Athough I doubt that is the real name for them, I do think its a good one. 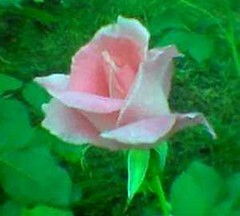 I saw this single rose this morning when I was out walking, so I took a picture of it with my phonecam. It looks like it belongs on a birthday cake. 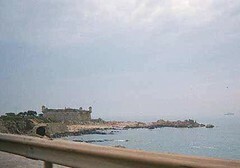 Time for another picture from Portugal, of a castle north of Porto with a view of the ocean. I took this picture on my first trip to Portugal. Mauro had planned a day trip to Vigo, Spain, as a surprise, and on the drive back to Porto, I took this photo. I think this was taken near Viano do Castelo. In the original photo, there was an airplane banner in the sky that announced "Obrigado Portugal" (Thanks, Portugal) That post-election slogan was everywhere during my first visit, and it made me smile. Tonight I copied the image and used Painter IX to (reluctantly) remove the tiny banner for the sake of the composition. With or without the banner, it's always great to be there, and I still agree with the sentiment. Obrigada, Portugal. This photograph was the source for the painting I mailed off to my friends yesterday. This photo is just as it was e-mailed to me, except that tonight I cropped the edges to square up the image and adjusted the contrast so the photo would show up better on the screen. 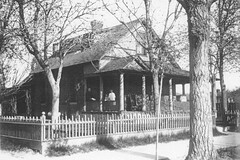 I like the placement of the house in this photo and the patterns of the fence and porch railing. I used the composition for the painting, but moved a few trees that were blocking the view of the house. 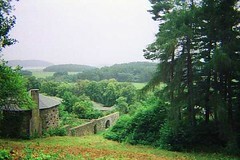 I relied on other photographs, mostly recent ones, for information about areas that aren't visible in this photo. I also used other photos to understand the structure of the rear part of the house, which is covered with vines in this photo. So my painting was a collaboration with the unknown photographer who took this picture, as well as with my friends who e-mailed other photos, old and new, drew diagrams, described colors, and even mailed me a piece of the brick so I could match the color. Here is the painting for my friends as it looked this morning, just before I sent it off to them. Since my posting of a "final version" a few days ago, I revised the upstairs dormer windows, which was very lucky because in the process, I noticed that the lines of the dormer roof needed to be fixed, and although it made me nervous to make changes so close to the finish line, I was happy with the results. By tomorrow, my friends will have the painting, so I will have no more updates to post here. But tomorrow I will post the old black and white photograph that got the whole project started. . . After that, time to get started on the next project. I took this picture today with my phonecam. I went to an event at Nashoba Valley Winery and Orchard, in Bolton, Massachusetts. 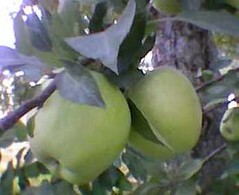 It's an amazing place, and the scenery was great, but I was fascinated by the huge clusters of green apples on the trees. This is another photo that I took in August two years ago, during my one-day vacation close to home in Ipswich, Massachusetts. This is Crane's Beach, one of the three destinations we managed to fit into one day. (The other two were Castle Hill and Russell's Orchard.) Crane's beach is very large and very popular. The day was slightly overcast, and so although it wasn't too crowded, it was still challenging to get a clear view of the beach. 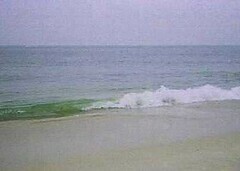 In fact, tonight I cropped this image from a photo that also shows several people enjoying the beach and ocean. But I wanted to focus on the waves hitting the beach, a fascination of mine ever since I saw the ocean for the first time when I was twenty-two. This is the final version of the painting for my friends. Recently I have been revising the upstairs dormer windows, and the tree on the left (one last time). Yesterday I told Mel that I wanted to hurry up and finish this painting so I could get it to my friends in time for their daughter's wedding next week. "Hurry up?" he said. "You've been painting this for months." Yes, but we had so much fun! Besides, you know what they say: The road to the house of a friend is never long. Here's another picture from my one-day vacation in August, two years ago, that I mentioned in yesterday's entry. 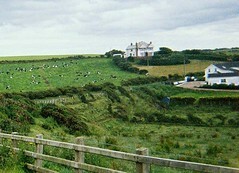 This is Russell Orchard, near Crane's Beach and Castle Hill. Tonight I cropped the image and used Painter IX's digital watercolor and chalk to clean up some little distractions here and there, so I am calling it a fantasy. But believe it or not, the color of the pink flowers is absolutely real and untouched. In August, these spiky pink flowers bloom all over the place around here: in the fields, in salt marshes, even on the side of the road off Route 128. I have been trying to get a good picture, but am usually driving past at high speed. So when I came across this photo tonight, I decided to post it. I love the way these flowers turn the most ordinary landscape into a fantasy land, even if the landscape is just behind the guard rail on the interstate. This is a view from Castle Hill in Ipswich, Massachusetts. I took this picture two years ago, but tonight cropped the image and adjusted the contrast for posting. Two summers ago, in mid-August, Mel was traveling to great places in Europe, but I couldn't go along. But I did have a wonderful mini-vacation close to home. Heather and I took the half-hour drive to Ipswich for the day, and went to Crane's Beach, Castle Hill, and then Russell's Orchard. It was an amazing day and the scenery was fantastic. I took two rolls of film in one day. You'd think I was a tourist! I think that one of the best things about travel is that it reminds us to look. But we can look when we are close to home, as well. Here is the painting for my friends as it looks today. Over the past two days, I changed the size of the two French doors on the front porch, and also changed the size of the two windows on the side of the house, and I like the proportions better now. I also added detail to some of the windows. I am still on the lookout for anything that needs to be corrected, trying to eliminate any distracting problems before I put this in the mail to my friends. 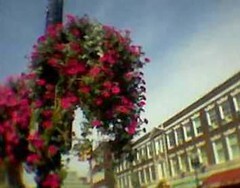 I took this photo yesterday with my phonecam during an early Sunday morning trip to Harvard Square in Cambridge. As we were beating a well-worn path from the COOP to the Harvard Bookstore, I stopped to take this photo of the baskets of flowers on the lamppost. Tonight I edited the photo, cropping it to emphasize the diagonals of the building and the lamppost. 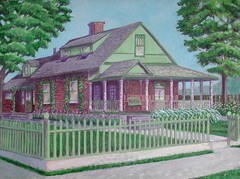 This is the painting for my friends as it looks today. Over the past few days, I have lightened the color of the sky, and worked on the foliage of the tree on the left. I also worked on the doors on the front porch, trying to get them to "read" correctly. At this point, I don't think there is anything new to paint in, but am waiting for feedback from my friends. Did I forget any of the details? Meanwhile, I am looking hard and trying to correct anything that does not look right to me. 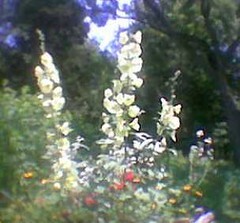 Here is a picture I took recently at Long Hill Gardens with my phonecam. 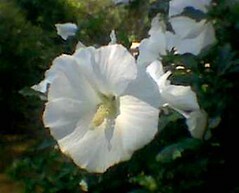 This time of year, there aren't too many new things blooming, but the old-fashioned hollyhock is a very sturdy flower that can withstand the heat of July and August. They have a very graceful shape when seen from a distance. Massachusetts has lots of great old fashioned ice-cream stands that are very busy on summer nights. Tonight we went out for ice-cream. The early evening was stormy, and the sky was very strange, almost yellow. By the time we got to the ice-cream stand, the sun was setting and the view was phenomenal. 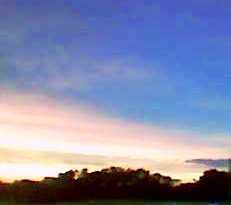 I took pictures with my phonecam, (which in fact didn't do the color justice, so later I cropped the image and adjusted the color to bring out the yellow in the sky.) The ice-cream was a treat, but so was the summer sky. This is an update on the painting for my friends. Over the past few days, I have adjusted the front doors, straightened the sidewalks, and painted the gutters. But I have been concentrating on light and shadow. especially on the roof and on the side of the house. I have also worked on the trees, and this morning finally trimmed them back a bit to improve the composition. Here's another picture from our 1994 trip to Brazil. Tonight I scanned it into the computer, adjusted the color, and pulled it into Painter IX to remove the pesky red date stamp that tells me that the picture was taken on July 31, 1994. 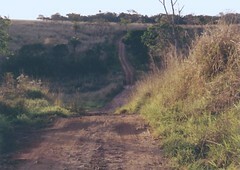 We drove on a lot of interstate highways in Brasil, but to get to and from the fazenda, we bounced around on roads like this one. It was a wild and hilarious ride! But everything we do with our friends is fun. When you visit people who live in another country, you get off the beaten path, and get a better sense of their country as a bonus. This is an example of "found art." Tonight I was loading pictures into the computer and editing them. It's a random process, and tonight I picked up a disk with Mel's photos from his 2002 trip to Leiden. I was just rotating, cropping, correcting the color (which was "off", but in interesting ways). 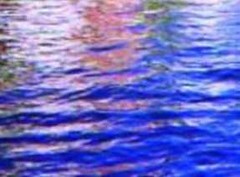 I became fascinated with the images of water in the canals of Leiden, so I zoomed in. This image is a detail cropped and enlarged from one of the photos. This is the very latest version of the painting for my friends. Today I worked on the roof, painted in more detail on doors and windows, and pruned the tree on the left. I also worked on color, light, and shadow -- going back to the basics now that most of the details are in place. By the basics, I mean creating the illusion of three dimensions on the flat surface of the canvas.